With the upcoming release of her fifth CD, Wings Uncaged, coming to radio September 10th, and a street date of September 7th, the very talented jazz singer and songwriter Aimée Allen has made her most mature and original musical statement to date. She has always displayed warmth, creativity and swing in her singing while her songs have consistently been thought-provoking, expressing insights that are both contemporary and timeless. 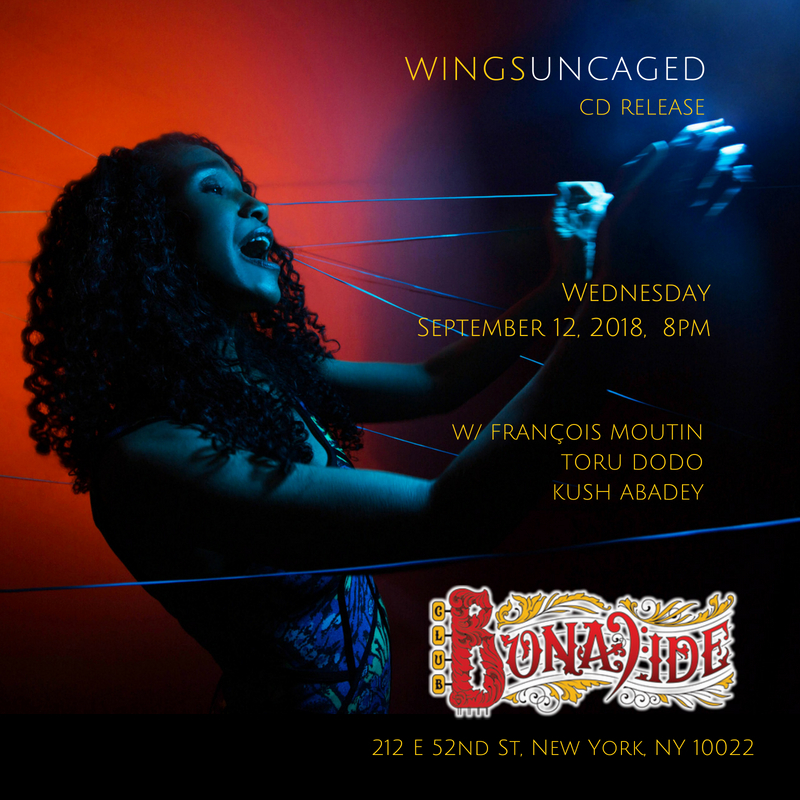 Wings Uncaged is filled with inventive reworkings of a few favorite standards along with five new and memorable originals, featuring Aimée Allen at the top of her form. A native of Pittsburgh, Pennsylvania, Aimée remembers: “There was a lot of music at home. As a child, my mother sang around the house, so I did too. My brother played guitar and I played a bit of piano. I remember hearing classic jazz,, Ella Fitzgerald, Sarah Vaughan (my all-time favorite), Abbey Lincoln, Jobim, Astrud Gilberto, Al Jarreau, Pat Metheny, Betty Carter, Carmen McRae, and Nancy Wilson. I also listened to AM radio and a lot of classic rock including Steely Dan, Chicago, Stevie Wonder and Michael Jackson. I sang in school choirs and occasionally in church, and played the flute as well.” While attending Yale, Aimée began to take singing more seriously, performing in a cappella groups. She went to Paris as an undergrad and started to sing professionally at duo gigs in piano bars. “Paris immediately felt like a second home to me, and I found that the jazz I grew up with was very popular there, even more recognized than in the States.” She teamed up with top local musicians to form Le Bossa Novices, singing Jobim tunes and other Brazilian music. Return visits to Paris found her leading her own quartet, appearing at clubs and festivals. “Shooting Star” is a love song about how something bright and remarkable entering one’s life can cause uncertainty about the future, even while it cannot be denied. “Night Owl” celebrates the owl as a metaphor for noncomformists. “It’s about those who go against the grain, embracing things that others shy away from. They can make a paradise out of darkness.” “In My Web” is an unusual and dark love story. “Touch The Sun,” which sets Aimée’s lyrics to Moutin’s music, was inspired by the starling flock moving en masse across the sky, a throng of birds choreographed like threads in a single tapestry, shifting and turning on a dime, creating light and shadows in unison. The most riveting piece of the set is the politically aware “Democracy How (Harmony and Dissonance).” A call for action, it asks how we can participate in a system when truth is ridiculed and divisions weaken the common ground we share. It is about the individual and collective voice and the need to use it to speak out . Aimée Allen gets vivid reactions from audiences when she performs her compositions. Some of her original music has been licensed for feature film and network television. She performs regularly in New York, has dates in Europe, and is always working on creating new music. And she is very grateful for the support that she has received from fans in her Indiegogo campaign for Wings Uncaged. Aimée Allen and jazz both have a bright future.